MIAMI (22 de marzo, 2019) – La estrella internacional del género urbano Nicky Jam, anuncia el lanzamiento de su nuevo sencillo y videoclip “Te Robaré” junto a su homólogo boricua Ozuna, en una combinación “explosiva” y muy esperada por los fans de ambos intérpretes. 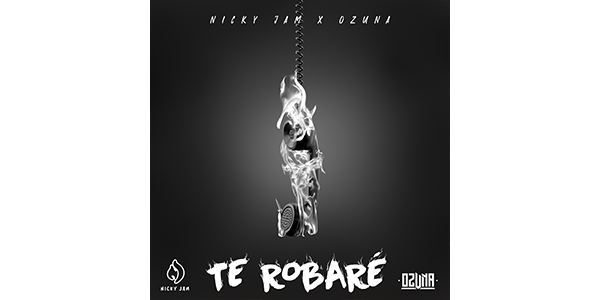 MIAMI (March 22, 2019) – The international urban reggaetón superstar Nicky Jam, announces the release of his new single and video “Te Robaré” with his Puerto Rican counterpart and friend Ozuna. An explosive, much awaited collaboration for their fans. The single titled “Te Robaré” (I Stoled You), was inspired by both singers along with talented composers such as: Juan Diego Medina, Johnatan Ballesteros, Vicente Saavedra, Carlos E. Ortiz, Juan G Rivera and Nino Karlo Segarra. The anticipated single was recorded in the city of Miami under La Industria INC.
“Te Robaré” is available now on all digital platforms, including YouTube. The music video was directed by the renowned producer and director Jesse Terrero, using the city of Miami as their key location and backdrop for this year’s musical hit. “We are very happy to be able to share this new single with the fans of the reggaetón genre, we are sure that they will enjoy this song as much as we do,” stated Nicky Jam. In the midst of the release of this new single, the Latin urban music idol Nicky Jam is preparing his new U.S. tour “Intimo Tour 2019,” which will kick off on April 11th in the city of Chicago and will continue through May 2019. The singer will also be taking part in this year’s Billboard Latin Music Awards where he is finalist 13 categories including “Hot Latin Song of The Year” and “Streaming Song of the Year.” The Billboard Latin Music Awards will be held on April 25th in Las Vegas ,Nevada and televised live by Telemundo Network.